Now the summer months are coming into their own, it’s time to get the garden tools out to keep your garden looking its best. Did you know that there are other benefits to gardening besides the odd compliment from your neighbours? Gardening has been proven to improve mental health, and this post will reveal all…. We are all living in a digital era, where we rely on the internet and social media to connect with each other 24/7. Sometimes, it is hard to switch off from the digital world and relax. Being in the outdoors can relieve the everyday pressures that we face, and help us reconnect with nature. No matter what the stressor in your life may be, gardening could help you. It has been proven that gardening can release stress and improve your mood. Being outside in the garden allows us to become care free and relaxed. Something as simple as just sitting outside can improve your mood and allow you to regain a positive outlook on life. 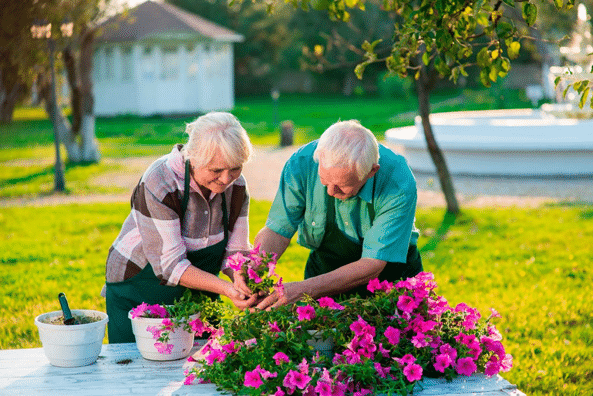 If you have found yourself becoming less active over the years, gardening could be a great way for you to get moving again. Age and disability can be big influencers; however, you can work to your own pace in your garden. Gardening can also give you a sense of responsibility which you may think you have lost. Whilst gardening, it is easy to find like-minded people who also enjoy being in the outdoors. New friendships can be formed whilst keeping your mind active. Feeling connected to people can improve your mental health greatly. No matter how big or small your outdoor space may be, gardening is easy! So, opt for the outdoors this summer and take care of your mental wellbeing.